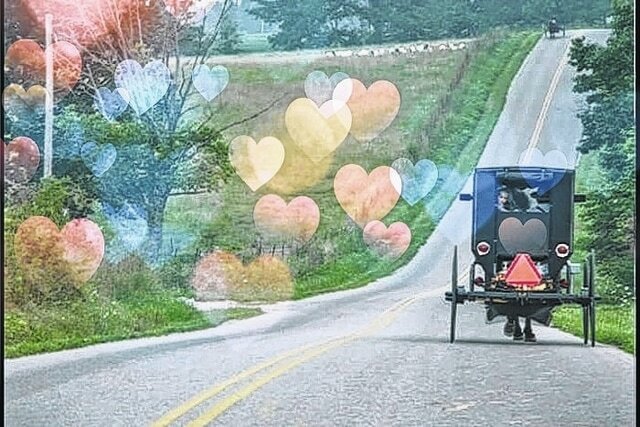 A buggy with superimposed hearts for Valentine’s Day. GLORIA: What goes through your mind when you think of Valentine’s Day? Love? Joy? Sadness? For us it is a special day celebrating love, although we don’t always do something extravagant. Sometimes the little things express love just as much as the big ones, maybe more. Does love get old? Isn’t it true that after a wedding day celebrating love many, many times the romance with its fuzzy feelings is fast declining after a month and by a year love is stretched to its limits, threatening to give up altogether? The most wonderful person you married simply isn’t like you expected him to be! What makes our marriage so special to me isn’t that were perfect, but rather that our mistakes are erased as we forgive one another then go on with life. So, yes, my husband Daniel and I have had our share of bumps along the way but we have also discovered those warm feelings of love we felt in our first weeks of marriage are also quite possible seven years down the road. Where there is a genuine heart connection, there is life. I still love rekindling memories with Daniel about his first visits here from Ohio, what we talked about on our first date, the day of our engagement, and then of course being his brand new bride. My dream had come true, the one I adored was my husband for life no matter come what may. Now seven years later I look into his eyes and see the same love and tenderness I did back then. Today I am thrilled to call Daniel my best friend. Understanding Daniel’s likes and dislikes has helped me better understand what I can do to show him my appreciation. Something I have learned that conveys love is greeting him with a genuine smile when he comes home from work. It only takes him a second or two to figure out how I’m doing and what frame of mind I am in. He really does deserve being welcomed home from work with love and happiness and a table full of steaming, home-cooked food. How about joining me on this Valentine’s Day in dedicating it entirely for the good of our husband, treating him like a king. You may be amazed how you will be treated like a queen in return. DANIEL: Wow, this past year went fast. I have to ask myself: “What does Valentine’s Day mean to me?” As I look over the last seven years of our marriage we have had our humps and bumps but I can say we have learned a lot. As you can all hear I have the most loving, patient wife. Her outlook on life is amazing. Very uplifting. I wouldn’t trade her anything in the world. Yes, she is that special to me, her heart is smothered in gold. I find a connection with my family very important. We make it a goal to spend a lot of time with one another. That is when the love river flows. What I have learned is that it is not the many hours that I work or the money that I make that makes my wife feel special. For my work, I build furniture, but with my wife I try to build connections, taking time to ask: how was your day? What can I do to make your life easier? How can I understand your heart better? Do I take enough responsibility with the children? If you could change one thing about me, what would you change? (You might want to be ready for that one!) How do you rate our marriage on a scale of 1 – 10, and what would it take to get us to a 10? I have also found it very rewarding to help my wife in the kitchen, helping her with cooking, baking, and washing dishes. Julia, Austin, and I have very special memories of baking fresh cookies when Gloria was on an errand. Gloria likes surprises like that! Hey, to you men: would you join me in making this the best Valentine’s Day ever? Gloria mentioned the other day that she wanted a lemon pie. I think I’ll make her one for Valentine’s Day. Here is the recipe. Mix sugar and cornstarch and add milk. Bring to a boil and cook several minutes and add egg yolks and boil gently. Next add lemon juice, lemon flavoring and a pinch of salt plus butter. Cool a bit and add 1 cup sour cream. Pour into a baked 9-inch pie shell, top with whipped topping. Refrigerate for at least one hour. https://www.recordherald.com/wp-content/uploads/sites/27/2017/02/web1_buggyheart.jpgA buggy with superimposed hearts for Valentine’s Day.